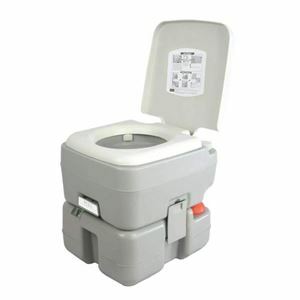 You can't avoid dealing with the inevitable, so get your plumbing sorted efficiently and cheaply with these ten portable toilets. 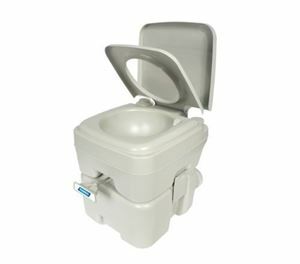 A portable toilet that takes the simplistic approach, the Bo-Camp is best suited for those who want to travel as light as possible. 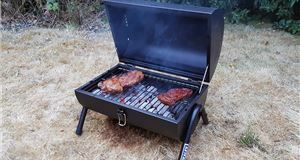 The grey exterior offers a good-sized seat and sturdy lid, while inside there is a tough black bucket to carry the waste, with a lockable lid and strong handles for easy removal and disposal. 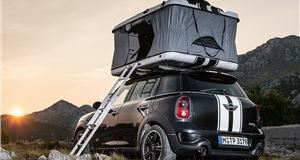 Considering the very modest price, the Tinkertonk is both sturdy and practical for campervan use. Fill the water tank with up to 12 litres and there is 20 litres of waste capacity available, which should get you through several days before an empty is required. 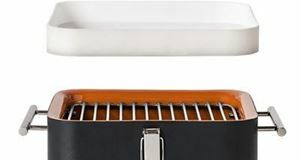 By stacking one tank above the other it helps to keep the dimensions compact too, at just 34cm x 44cm length and width. 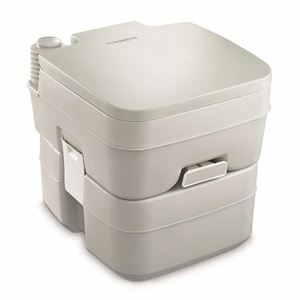 Another portable toilet under the £50 mark, the 966 is the cheapest in the Dometic range but has gained almost 100 five-star reviews from Amazon customers. It mates a 9.6-litre water tank with a 19-litre waste tank, and the compact design includes a simple bellows for straightforward flushing. Double seals on all tanks should ensure low odours and large discharge pipes make for easy disposal too. A remarkably inexpensive offering from Blue Diamond, the WAT225 has large tanks of 16 litres for both fresh water and waste to give the capacity for several days of use before disposal is required. A manual flush means and a toilet roll holder are included for maximum convenience, with the removable cassette including a sturdy handle to make removal as easy as possible. 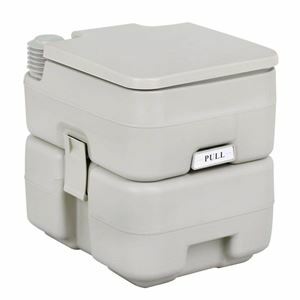 The Camco is also available in Premium guise and in 2.6 or 5.3 gallon forms. 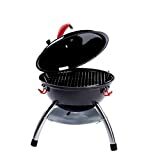 This is the smaller version with a 9-litre waste tank, which is detachable for emptying and includes a slide valve that automatically seals to prevent leaks and odour. 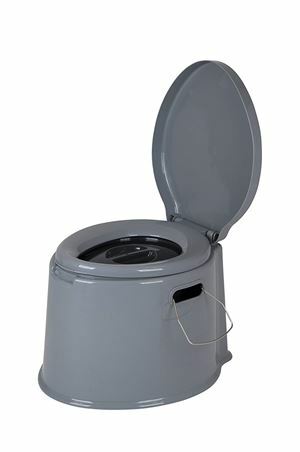 The robust pump ensures quick and efficient flushing and a pair of latches keep the toilet safely attached to the tank. 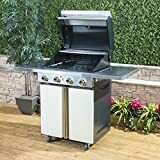 A solid gold hit with Amazon customer reviews averaging out at 4.5 stars, the vast range of Thetford Porta Poti can be bewildering, but this 365 model is a size suitable for most motorhomes and campers, although there is a smaller 335 version to go in smaller vehicles. Add the appropriate chemicals and all waste is collected in the cassette, which is emptied quickly and easily. Although one of the more expensive offerings in this list the Elsan Bristol Toilet takes a very simple approach to portable toilet concept. 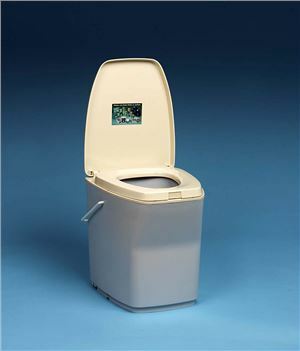 Rather than a flushing mechanism or separate tanks, the Bristol is simply filled with a suitable toilet fluid (Elsan sell their own brand), and once full you remove the lid and carry it using the handle to a suitable disposal site. What it lacks in sophistication it makes up for in robust design and construction. 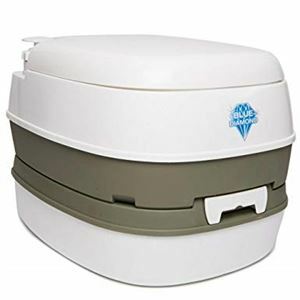 Even allowing for the delivery costs from the US this SereneLife portable toilet is packed with features for comfortable and easy use in the wild. 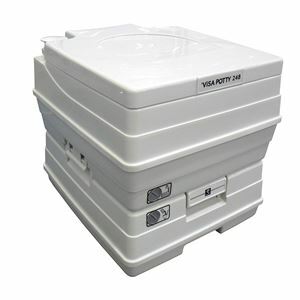 Designed for use in variety of locations the SereneLife has a 12-litre water tank and 20-litre waste tank, which the company says is sufficient for 50 flushes before emptying is required. An attached cover fits over the toilet to ensure security when transporting it, and double seals throughout promise minimal odours. 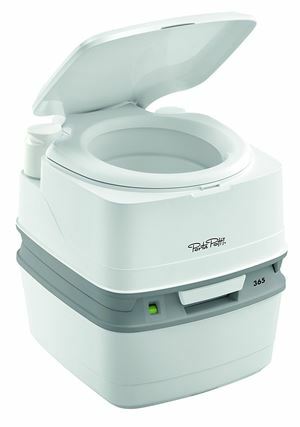 Collecting several hundred positive reviews from Amazon customers, this Visa Potty 268 has a wealth of features to provide quick and convenient use, including a replaceable piston pump with twin jets for efficient cleaning and an extra deep bowl for comfort. Indicators for both the fresh and waste water tanks mean you’ll never run dry, and the lid secures to prevent odours when on the move. Similar to the Qube 365 model, this Thetford Excellence adds the luxury of an electric flush which can be a useful addition if you have children who need to make use of the toilet. 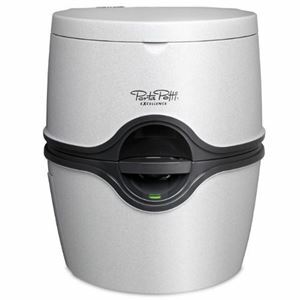 It holds 15 litres of flush water and can hold up to 21 litres of waste, so despite the compact size it won’t require emptying too often. A toilet roll holder is built in and there’s an indicator to ensure the flush water tank doesn’t run dry.